Charles Mortimer played John Shard in "Hush Money". In the stage of 24 October 1912, it was stated that "Mr. Charles H Mortimer scores with a well-balanced portrayal of John Shard". As yet, it is not known at which theatre the play was performed. From the advert to the right, it seems that Charles and Nora could be contacted at 32 Regent Street in the West End of London. 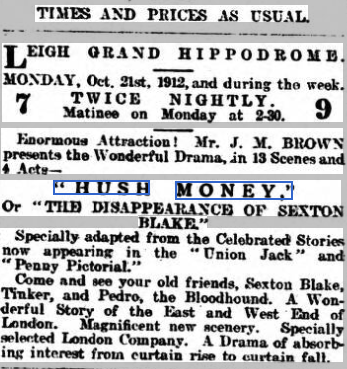 The play was at the theatre Grand Hippodrome, Leigh, and the Grand Theatre, Stonehouse in November, 1912. From The Shields Daily News 11 November 1912. From The Leigh Chronicle and Weekly District Advertiser 18 October 1912.